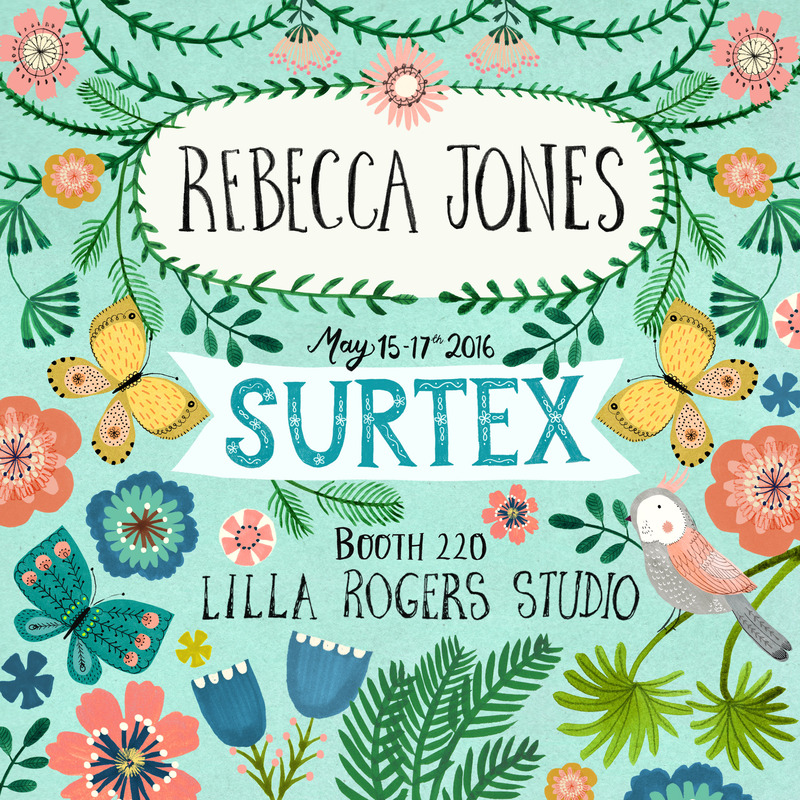 Been so busy, lots of projects on, and creating my folio and banners for Surtex in New York. It’s just 10 days away now! It’s been a crazy year. Glad it’s time to wind down, spend time with family, relax, eat too much, and generally laze about doing nothing. Still have a bit to do before Christmas day – a gingerbread house to be decorated, presents to be wrapped, fudge to be made…. 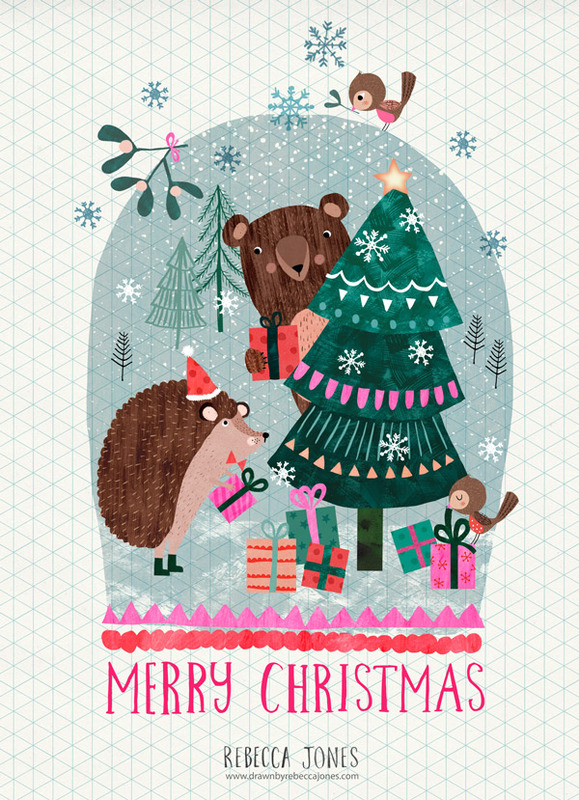 Whatever you’re doing this Christmas, I hope you have a fabulous time with family and friends. It’s always time for tea in my house. I blame it on being English, I drink a LOT of tea. And I love nothing more than buying new tea cups and teapots. I’ve been really busy these last few months, lots of new projects on, and I barely have any time to do any personal work. But after buying some new watercolours, I did manage to squeeze in a bit of time to paint a few tea pots and tea cups. Once I started I couldn’t seem to stop. I’ve been so busy recently, lots of different things going on in my life. But I have been really lucky to have been working hard on lots of different projects. 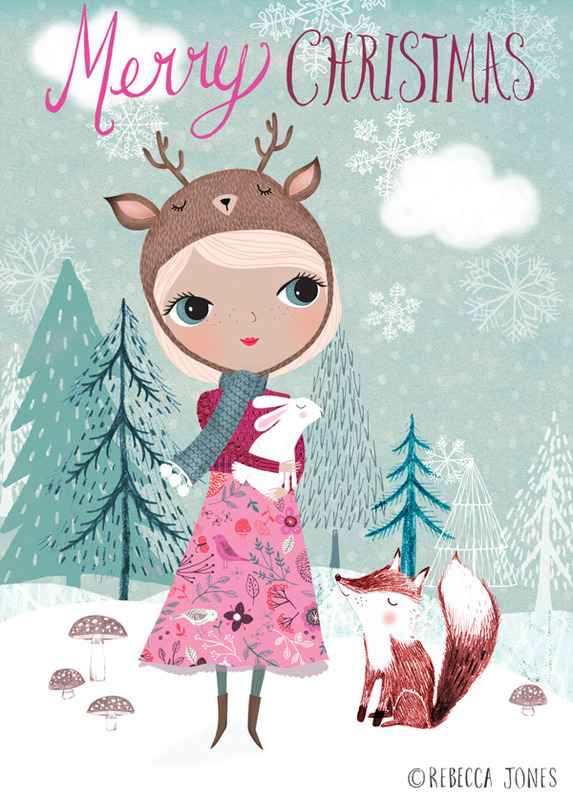 One of the cool jobs I got to do recently was some posters for gorgeous kids online store, Psikhouvanjou! 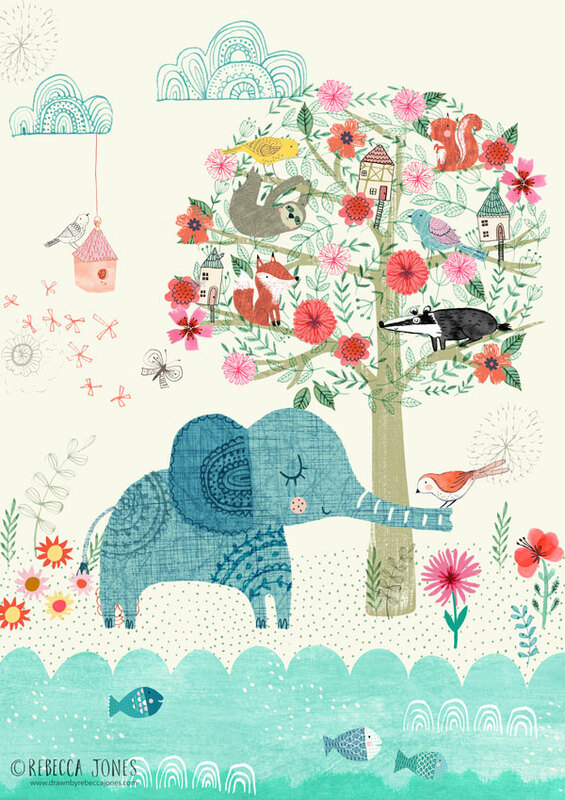 Based in the Netherlands, they sell the most beautiful selection of products for babies and kids. I got to do 3 posters for them. 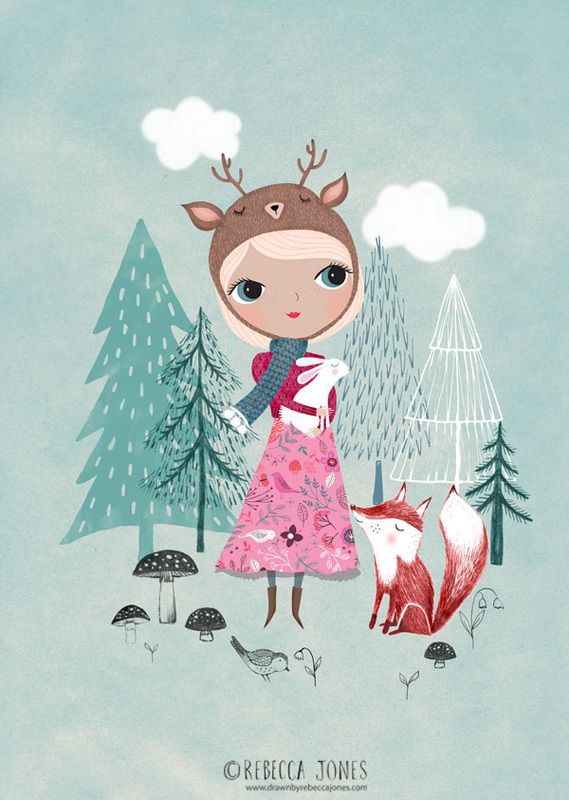 One using my Nature Girl and one adapting my Deer Girl from my Christmas cards. And I also got to have a huge amount of fun turning my Super Sleuth image (which I originally created as part of the Lilla Rogers Global Talent Search) into a poster that would appeal to boys. I loved doing this one! 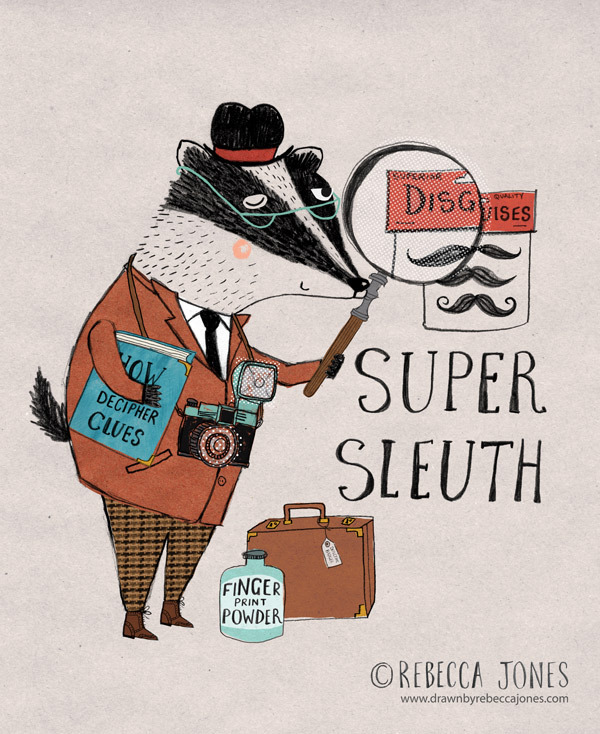 As you probably might know, I have a 6 year old son, so we had a great time together deciding on all of the things that I should include….Mr Super Sleuth himself, some spy glasses, spy pens, voice recorders disguised as chewing gum, spy umbrellas, and loads of other things too. And of course, a cheeky raccoon with something to hide, trying to escape the scene of the crime…. 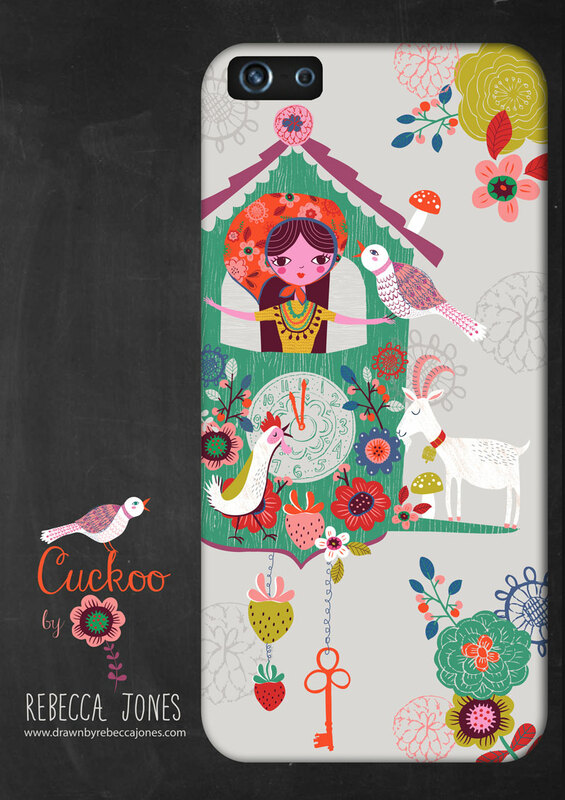 And I’m so excited that now all 3 posters are available to buy from Psikhouvanjou! New Prints in my Shop! Well I can’t believe it’s February already! I thought it was time I updated my Etsy shop with some new prints. 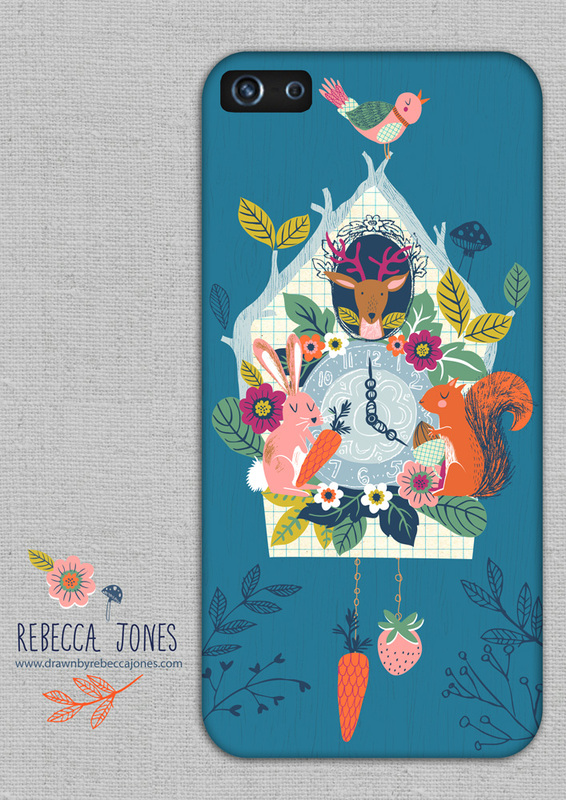 My latest prints would be perfect for a child’s room or a nursery, with some sweet (and some sleepy) little animal folk in them. 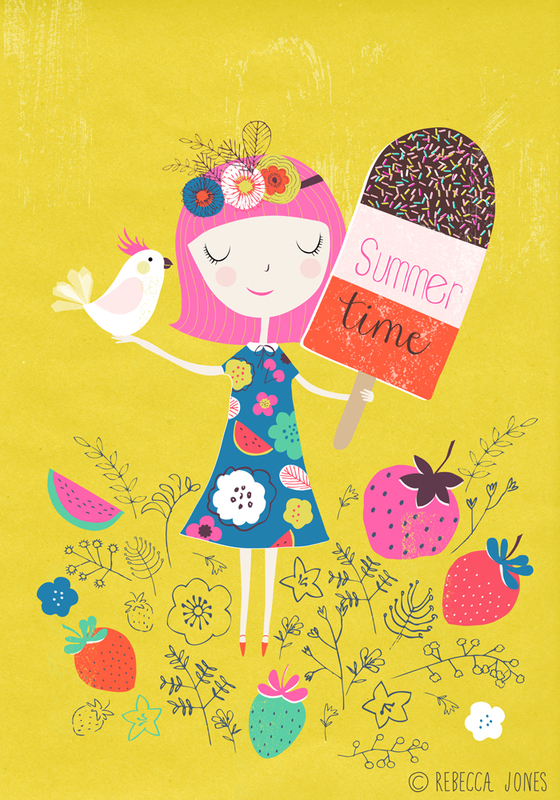 I’ve been super busy recently creating lots of new work for Printsource! 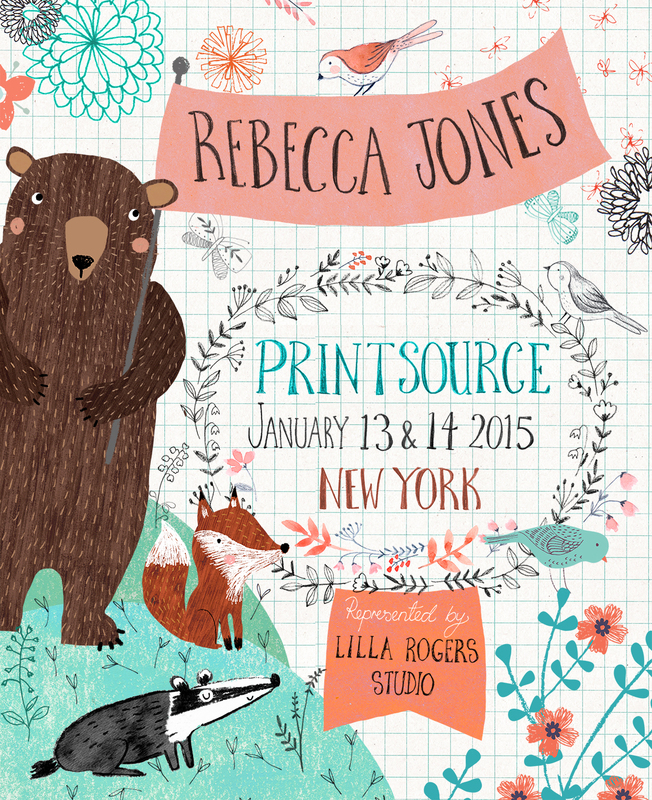 I’m very excited to have my work at the show this year, represented by Lilla Rogers Studio. Yay! It’s been a crazy year! 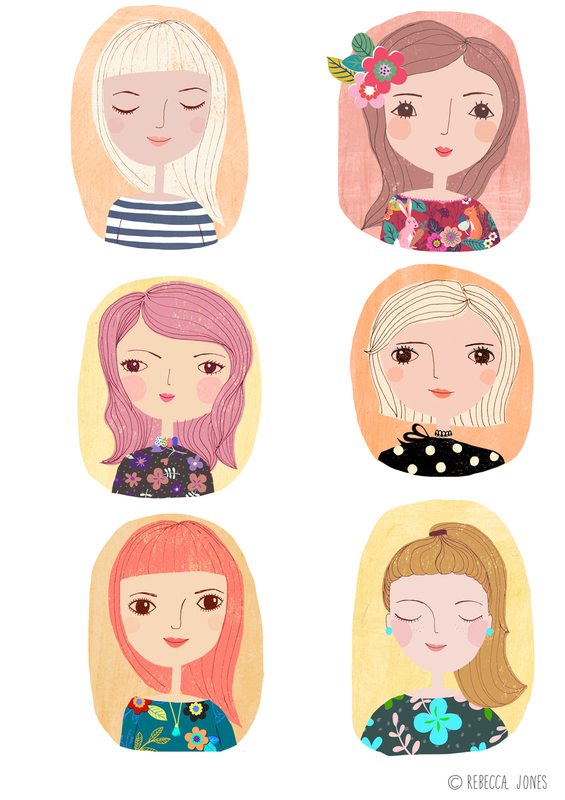 I’ve been so busy the last few months with so many different things, and neglecting my blog. Wow, it really has been a good day. I found out this evening that I’m through to the final round of the Global Talent Search. I was totally shocked, and pretty excited. There were some fabulous and amazing entries, and I am so thankful to have made it through to the top 6. I have a lot of work to do now to complete my final project!! And also I have just opened my first Etsy store, selling some of my art prints. I’ll be adding more prints in the coming weeks. If you fancy a peek, please click on the picture! We got the brief for the next round of the Global Talent Search competition on the same day that I found out I had made the top 50. I glanced at it briefly, but as I had a bit of other work on, I just had to put it aside for a few days. The brief was to design an animal character with human attributes for a child’s t-shirt. My first thought was wow, this is such a wide brief, I can really do anything, how on earth am I going to decide where to start? Luckily my little boy Toby came to the rescue. Once I told him about the next brief, he was desperate for me to design a t-shirt for boys. Something cool, he said. I don’t do much stuff for boys, and I thought this was a good opportunity to challenge myself, and it also helped to narrow down my options. 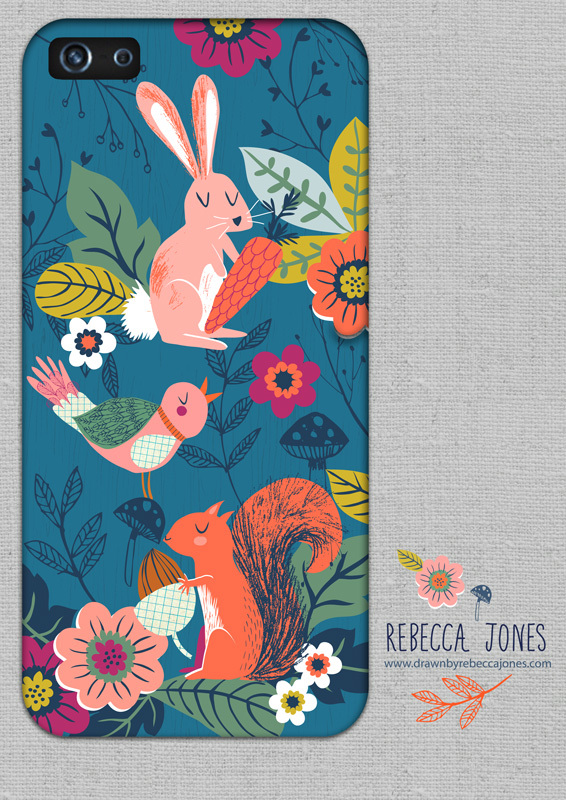 I then decided to stick to woodland animals, as they’re my favourite kind of animals to draw. In the end I didn’t have many days left to complete it. So I started off doodling on sheets of paper. It’s how I start all of my projects. I doodle away, writing random words down as I’m thinking of the possibilities. I try not to judge or be to critical of whats coming out on the paper. And with any luck after a few pages, ideas start to flow. 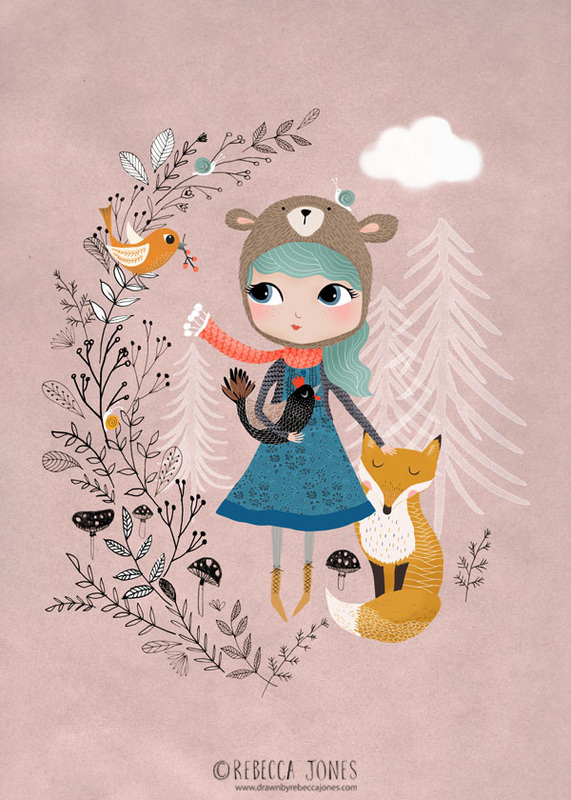 I drew foxes and bears, on adventures and exploring the world around them. 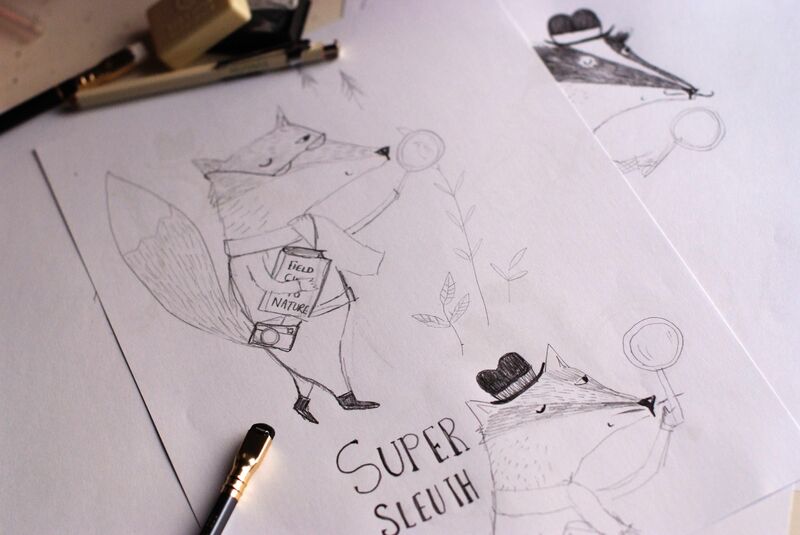 Then I drew a fox that accidently ended up looking like a badger – and somehow Mr Badger the Super Sleuth kind of grew from there. Oh, I do love badgers. I had a lot of fun thinking about what he’d wear – his tweed trousers and his brogue boots. And all the things he might have with him – his magnifying glass of course, a packet of moustaches for disguising himself, and his handbook on How To Decipher Clues. 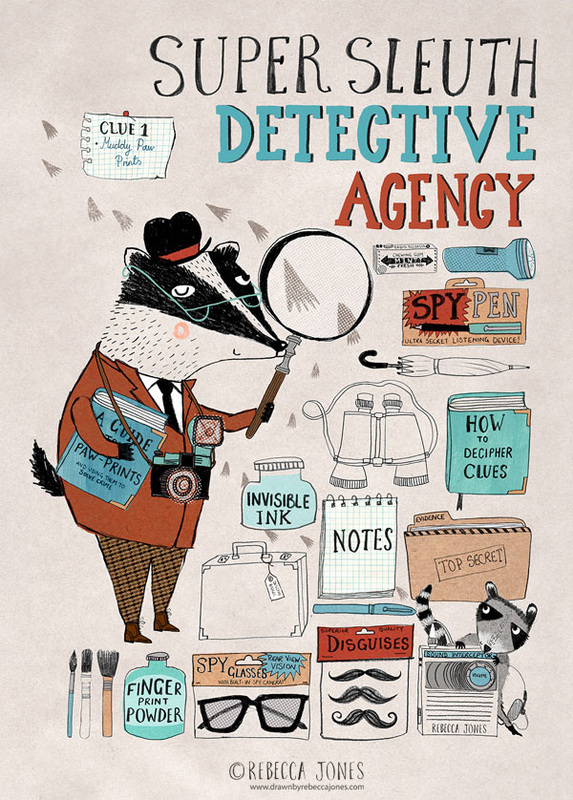 A must for any detective. 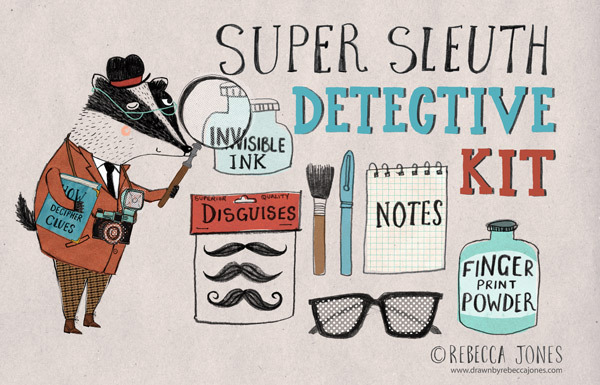 Within the brief we were also allowed to include ideas for any other accessories that the art might work on – and I immediately knew I must design the case for a Super Sleuth Detective Kit. My little boy would love this! Once it was finished, Toby gave it his final approval, and declared it to be cool. And with that, I pressed the submit button. And my final piece was done. Out of the 50 semi finalists, 5 will be chosen by the judging panel to go through to the final round, and 1 peoples choice will also be chosen, this will be the piece with the most votes. So if you would like to vote for my piece, please follow *this link* and head to the online gallery to cast your votes!! There are lots of fabulous pieces of work there. But it would be super lovely if you liked mine enough to vote for it. Thankyou! I made it into the top 50!! Wow! Just heard the news that I made the top 50 of the Lilla Roger’s Global Talent search! I am still in shock I think. I had pretty much convinced myself once I started seeing some of the work that had been submitted that I probably wouldn’t make it any further. So I was totally shocked when I saw my piece listed with all of the others that made it through. We got the initial brief a couple of weeks ago. I was both excited and scared once I saw it. Wall Art? On no! Not sure I can do that. But terrariums? Oh yes. I love terrariums, despite the fact that I have yet to keep one alive. My little boy is totally fascinated by them, particularly the ones that have animals or people inside them. We’ve made a few of our own over the last year. Though now we’ve had to resort to fake plants. He delights in choosing the miniature things that will go inside from our local art store. He has spent hours and hours arranging crazy little scenes, totally lost in a world of his own imaginings. 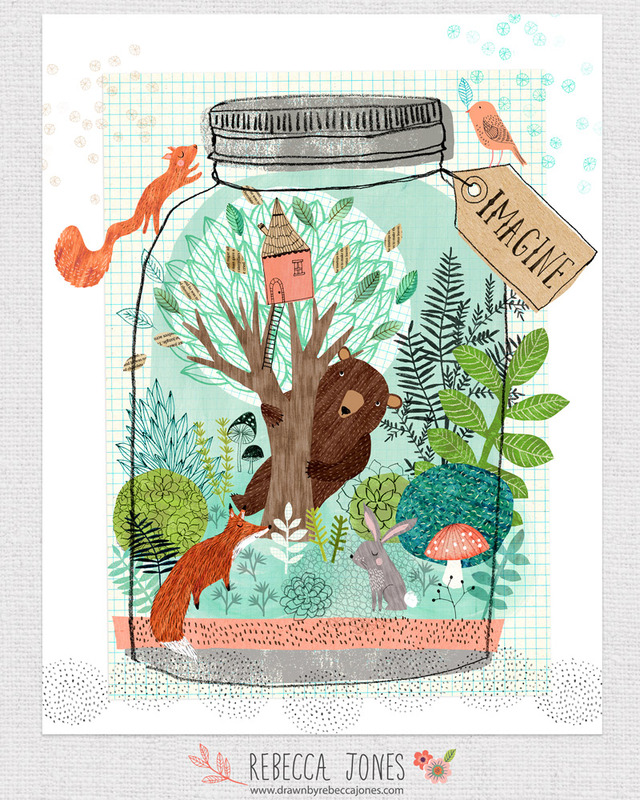 I thought that ‘Imagine’ could be a good word to use as inspiration for my piece. I decided upon a woodland theme, and it kind of grew from there. I hand painted lots of textures in gouache and watercolour, and scanned them in. I drew bits in pencil and ink and charcoal and scanned them in too. I painted leaves and toadstools in watercolour and then collaged everything together digitally. It was good that I had a few days to work on it. At first it was all a bit of a mess. Everything was green. I always find it good to just sleep on it. When I wake in the morning and look at it all again with fresh eyes, I know exactly what is wrong, what needs to go, what needs to change and what can stay. And here is my final piece. And if you haven’t already, please look at the gallery of work from all of the people who entered. There are some amazing pieces in there! I’ve recently been working with Pingsome. 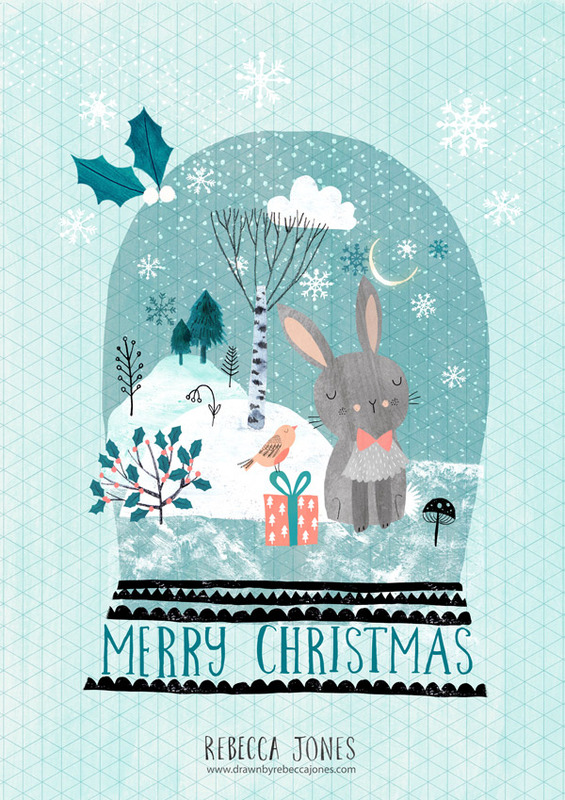 They have lots of truly fabulous e-cards, by lots of talented and well known artists. And they have animated some of my drawings, which was super fun to see. 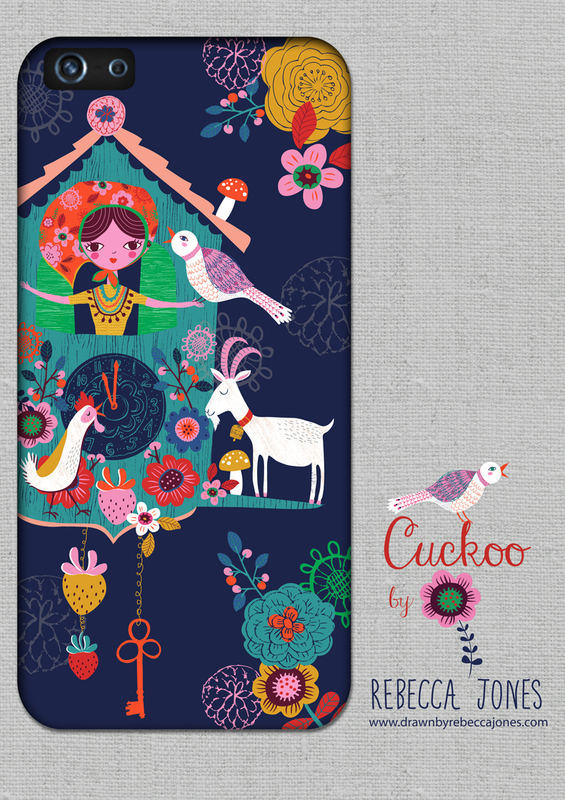 You can see my folky cuckoo lady above, if you click on the little arrow in the bottom left. And you can pop over HERE if you’d like to send it to someone. 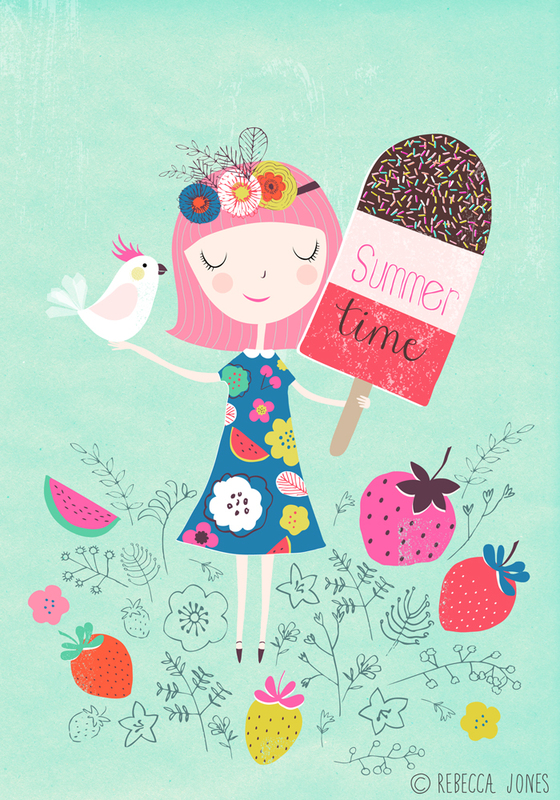 They also animated my ice-cream girl, which you can see and send to someone HERE. So I spent the last few weeks doodling faces here and there, and then we got our big assignment. To do an editorial piece to accompany an article on meditation. I love editorial illustration. I so want to be able to do editorial illustration. But I have always told myself that my work isn’t clever or conceptual enough to do this kind of work. And all that self doubt was niggling away at me as attempted to do this assignment. I wanted to do something a little bit abstract and free, but it just wasn’t happening for me this time. It’s not painterly or loose as I had so wanted to do, but this is my final piece. And the rest of the fabulous work created by fellow boot campers can be found HERE in the online gallery. I’ve had a bit of fun so far on this Bootcamp assignment just doodling faces. And adding some colour, and some cute clothes. So the last week of MATS arrived, and I felt a little sad. It has been such a great experience for me. I’ve really enjoyed the online interaction with my fellow MATS class mates, and I’ve loved Lilla’s teaching and the assignments we’ve been given. Most of them I would never have done on my own. I’ll really miss the course. 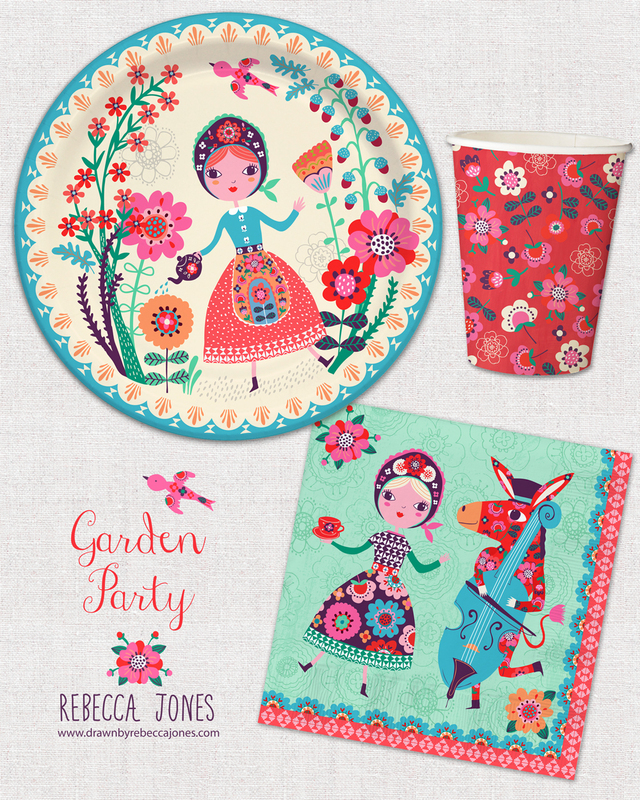 For the last week, our assignment felt a little like a celebration – we had to design party papers – paper plates, napkins and paper cups. And our theme was folk art. It was such a fun theme, and a great way to end the course. I planned on drawing folky girls with birds and chickens. And somehow I ended up drawing this donkey playing a double bass at a garden party. I thought maybe he was too ridiculous to actually make it onto my final piece. But I showed it to my classmates, and they all encouraged me to keep him. So the donkey got a reprieve. If I’d had a bit more time it would have been fun to have drawn more musical animals, I could have had a whole string quartet. Maybe I will, in the coming weeks. I really had fun doing this piece, and I hope it shows through. This week was all about Scrapbooking! I have not really done any scrapbooking before, so this market is a little bit of a mystery to me. But as usual Lilla guided us through with tons of inspiration and tips on how the market works. We had to draw vintage ink bottles and pens, and everything else was up to us. 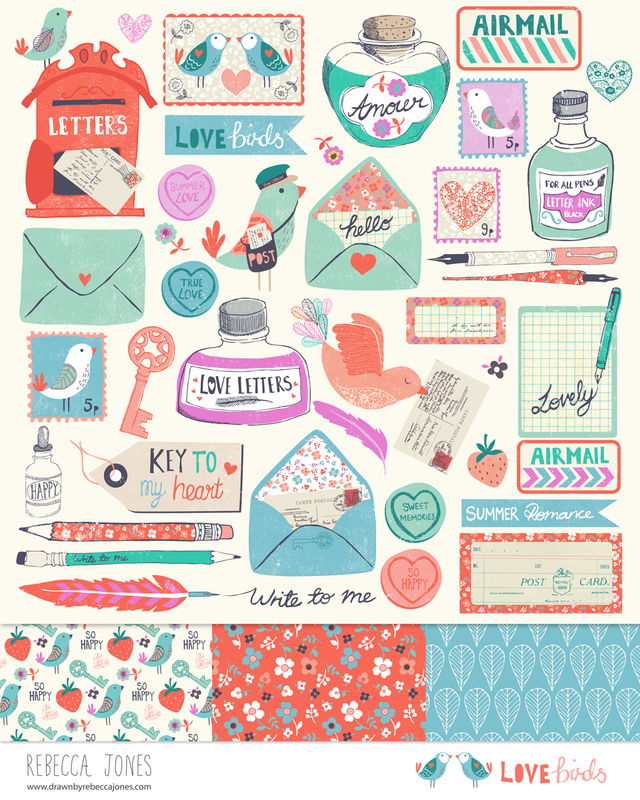 So I went with the theme of a summer romance – love letters and letter boxes, stamps and some of those Love Hearts sweets that I used to adore so much when I was little. And there is also a little bird that works for the postal service, delivering some letters too. I did manage to have a bit of fun doing this assignment! What I love so much about MATS is that it pushes and stretches you to do stuff that you would never think to do on your own. Sometimes when I see the weeks theme, it disappoints me. I think that I don’t really feel like drawing that stuff that week, or that it doesn’t really inspire me. But then when I start, I try to think about it from an angle that could interest me, I realise that there are lots of different ways to approach any theme. It just needs you to start drawing. 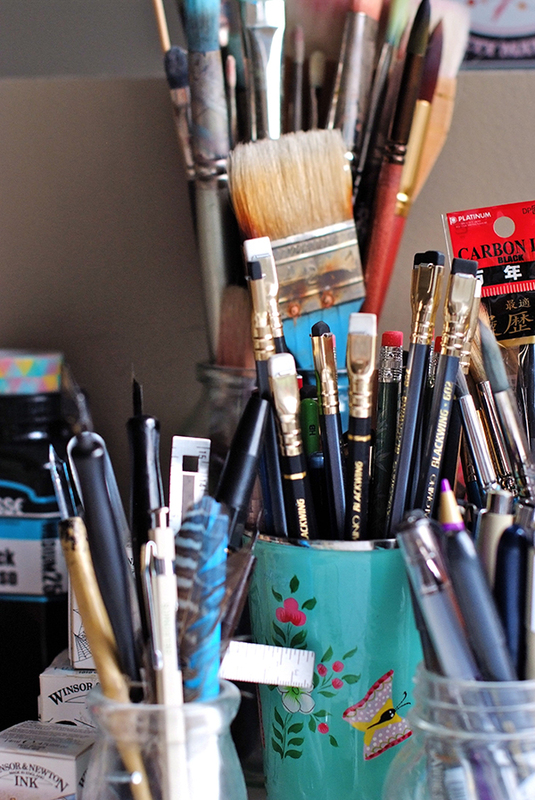 I have found that just to keep on drawing as much as you can think of is the answer for me! That and plenty of cups of tea and chocolate. Oh yes, there was a lot of that this weekend! 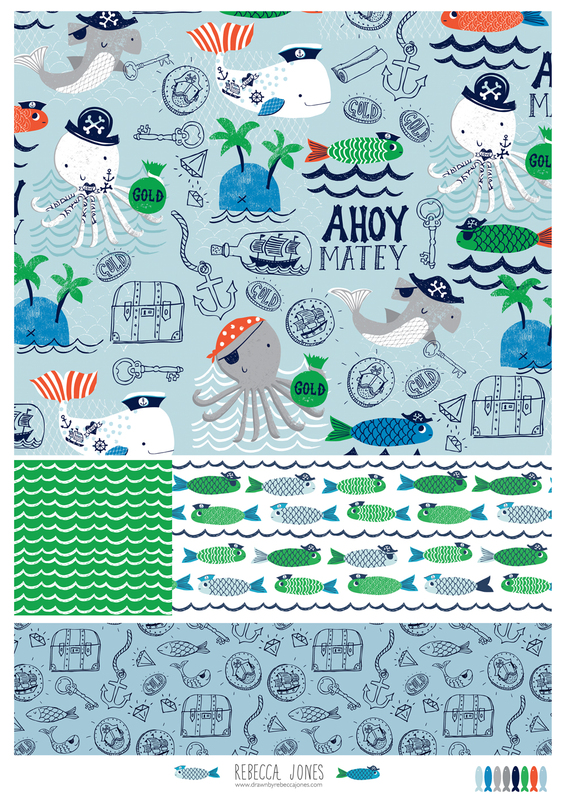 Our assignment this week was to design prints for baby apparel, using Pirates as our theme. I did a lot of drawings at the beginning of the week, of all sorts of things, and didn’t have a clue which direction I was going to take it in. I was a bit rushed this week, as my family and I were going away to the beach for the weekend. So I only ended up with a few hours on Sunday afternoon and evening to get the assignment done! I got a bit stressed about it all, but sometimes it can end up being a good thing – instead of mucking about endlessly changing things, I just had to make quick decisions and stick to them. And here it is, a bunch of sailor and pirate underwater creatures, looking for treasure. Phew! The first week is over. I has so little time this week to dedicate to this, with school holidays beginning, my husbands birthday celebrations and other work that I had on. Luckily Lilla always splits the assignments up into manageable parts, otherwise I would have been panicking. The weeks theme was gingerbread. 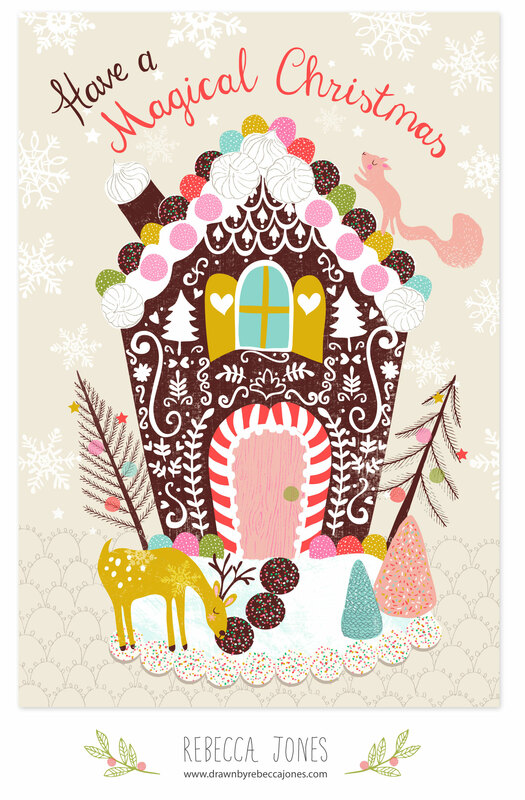 And our assignment was to design a Christmas card featuring gingerbread and other Christmassy things. I love Christmas and I love gingerbread houses, my little boy and I make and decorate one every year. Though when a 5 year old takes charge with hands full of icing and sweeties, the end result is never quite as pretty as I envisage! But I had a bit of fun putting this together this week. I made sure to include all the things we traditionally have on our house – gumdrops, candy canes, chocolate freckles ( I think thats an Australian term for chocolate buttons covered in hundreds and thousands) and we always have a deer in our iced garden. The squirrel just scampered onto the roof whilst I wasn’t looking. 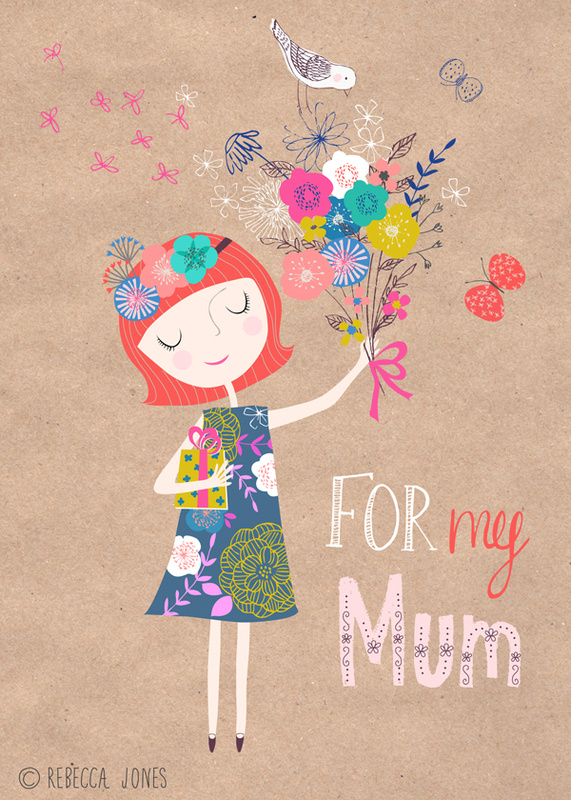 For my lovely Mum, a million miles away from me in the UK. I miss her so much. 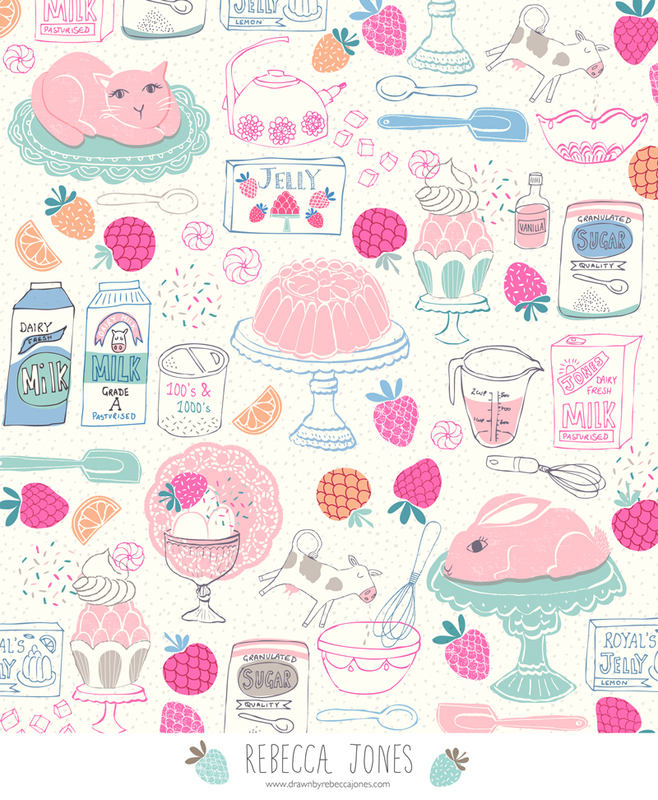 So here is the piece I submitted for the MATS Bootcamp Jelly assignment. We had to design something that could be used as fabric, with some co-ordinating designs if we wanted. Hopefully it incapsulates the joyful feelings I associate with jelly. Of parties and celebrations. Those magical playful moments of childhood. And there is a little bit of silliness there too of course. Jelly heads on plates and all. Included in this piece are all the things I loved as a child. Many of my childhood memories are vague and hazy, I don’t remember a lot of things. But if you were to ask me how the wallpaper, the curtains or the carpet looked, or the plates and crockery my mum had – I can describe them in great detail! 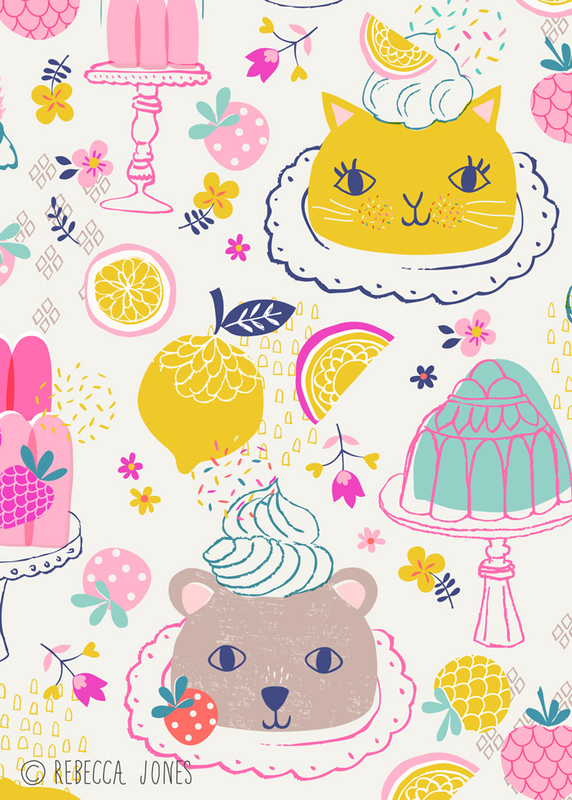 And I distinctly remember the pretty floral cupcake cases my mum used buy. So I drew them here, along with her vintage plates and the glass jelly mould that belonged to my grandmother. The fruit my mum would always pop into the jelly, that I thought was so sophisticated. And of course the ice cream and sprinkles that always accompanied it at any party. In hindsight I realise I should have include drawings of pineapple and cheese on sticks too – but I’m not sure anyone outside of England would understand that! I had a lot of fun creating this piece, and I hope it shows through. So this month in the Make Art That Sells Bootcamp, we had to draw jelly. I love jelly! It reminds me of my childhood, of birthday parties and celebrations, and generally happy times. It’s colourful and pretty and a little bit silly. My final design ended up being a little bit silly too – but I’l show you that another day. I really enjoyed it, there are lots of different ways you can approach it, and I tried and discarded quite a few of them before I could settle on which direction to take it. The gallery of everyone’s work goes live on Wednesday, so I’ll post my finished piece then. But here is a piece that I didn’t end up using, but thought you may like to see it anyway. A new print for my shop! 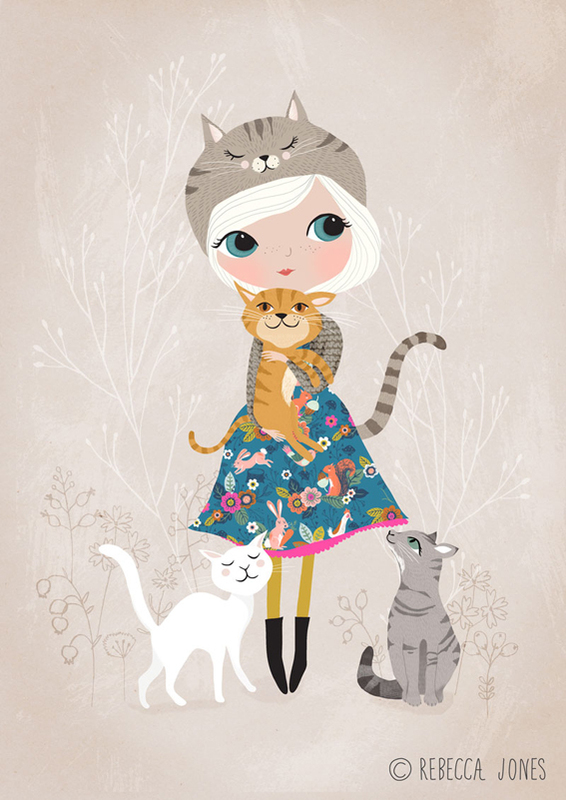 A cat loving girl, wearing a dress made from my Cuckoo Folk fabric. Available as an art print in my shop. 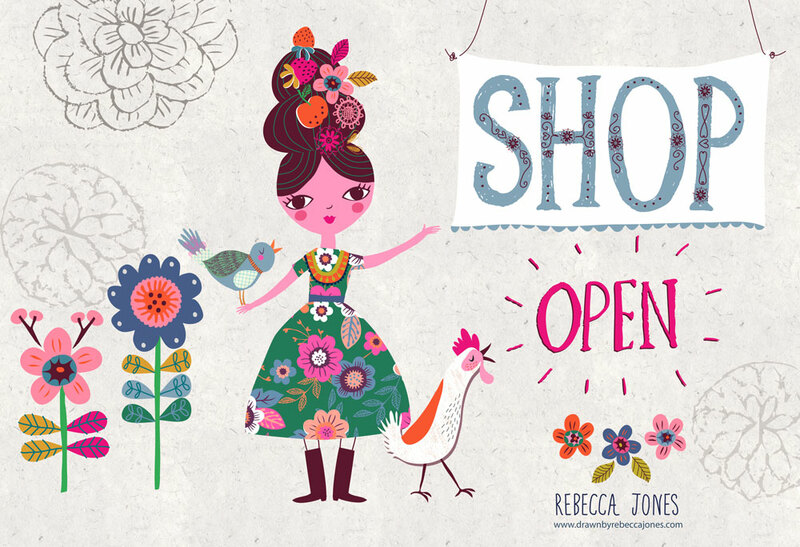 So, I have finally got around to opening a shop at Society6! I’ve had a few emails from people asking to buy some of my prints – and now you can! So please hop on by and have a look. Just click on the picture above. And if you use this link, you’ll get $5 off each item and free shipping* until midnight pacific time on the 9th March! Please use this link to get free shipping until 9th March 2014! 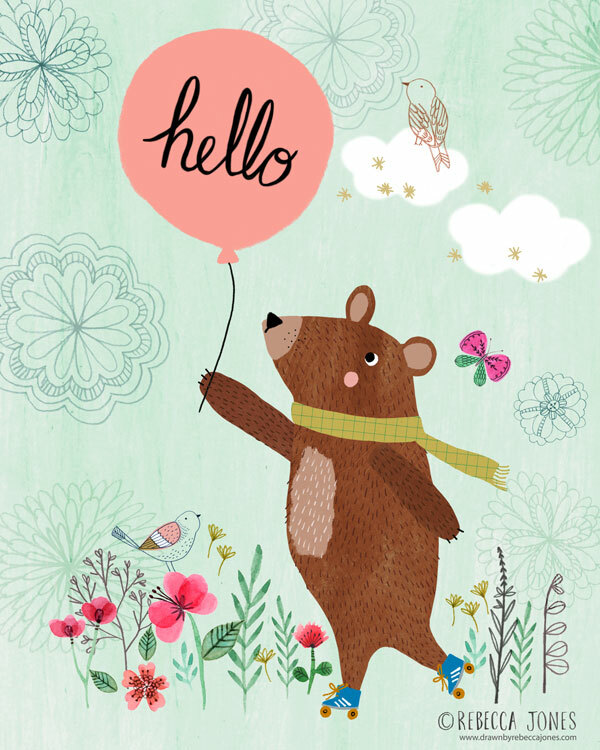 But of course, still trying to stay away from minty aquas, and trying out my new colour palette! Some woodland cuckoo folk. Then I tried to move away from using the clock shape, and just use the icons I had drawn. 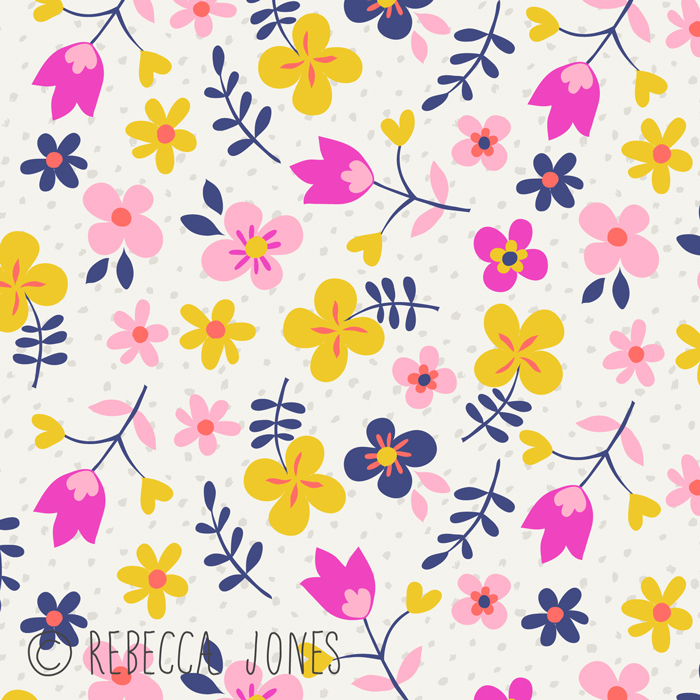 I liked it and thought it would be super cute as an allover print on fabric, it would be just divine as a little girls dress! 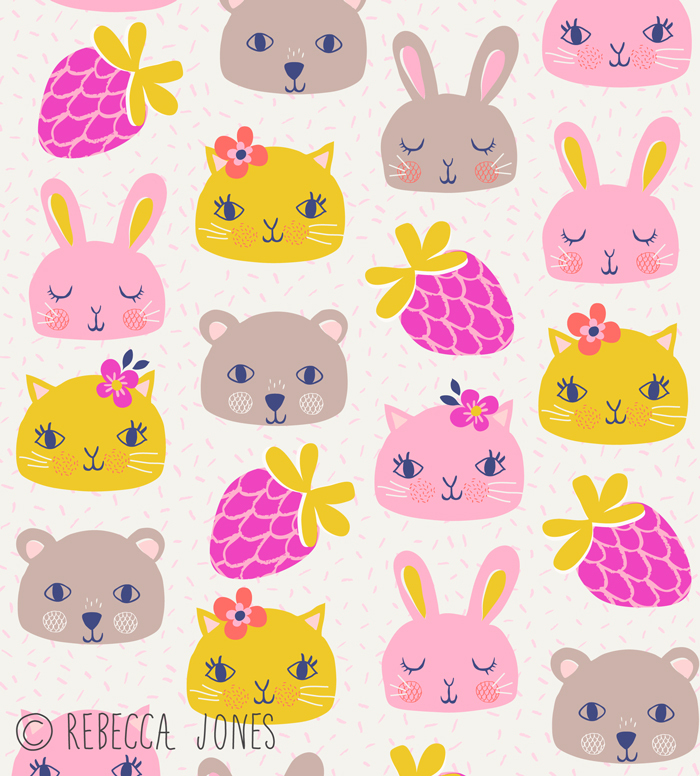 So I added a chicken and a jumping bunny and a few other bits and bobs, and here it is! It’s been a weekend of drawing non stop for me, and I’ve loved it! Lilla also challenged us to try a different colour palette. And I think it is about time I used some new colours! I am totally addicted to using all shades of aqua and mint. Every colours seems to sit so well with aqua, that I find it almost impossible to do a design without it! So this really was a challenge for me. But I was pretty happy with how this colour way turned out. I wasn’t quite happy with my goat farmer drawing I posted yesterday. So I revised it – adding some words, to look a little like a vintage poster. I used one of the great tips Lilla Rogers gave during the MATS course I took last July. After you think you have finished, you should add one more element to your piece, to turn a good piece into something great. I’m much happier with my goat farmer now, I think. It’s been a bit quiet around my blog recently. I’ve been super busy, with my family visiting from England. We’ve been on holidays all over the place – eating our way around beautiful Tasmania, and having some beachy fun in South Australia. And of course, eating a whole lot more there too. I think eating freshly caught crayfish whilst watching the sunset on the beach has to be one of the most blissful things I have ever done! I haven’t had a whole lot of time to do drawing, and I have really missed it! 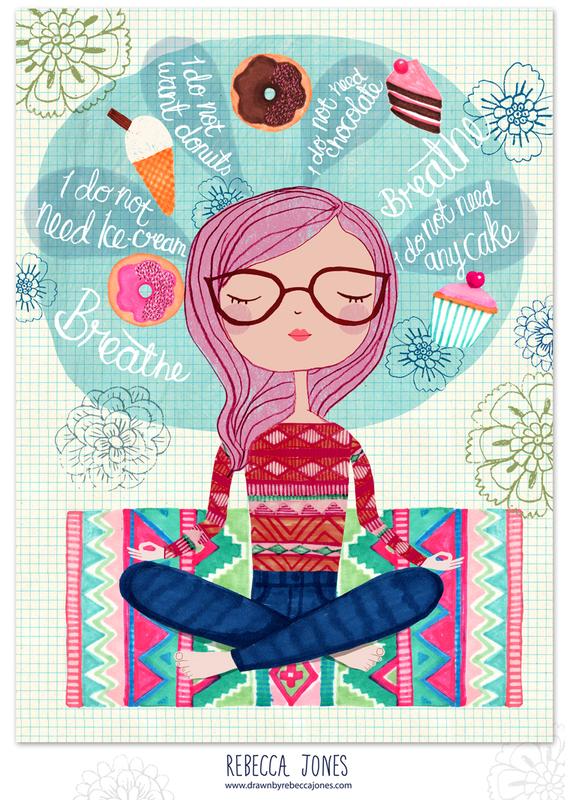 Especially as I signed up to do the Lilla Rogers MATS Assignment Bootcamp course. 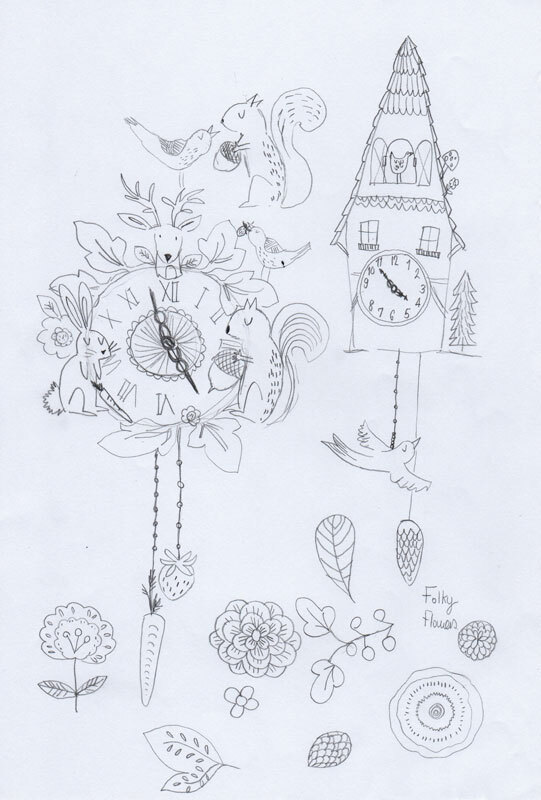 I read the brief whilst I was on holiday, and was itching to get started – drawing cuckoo clocks! 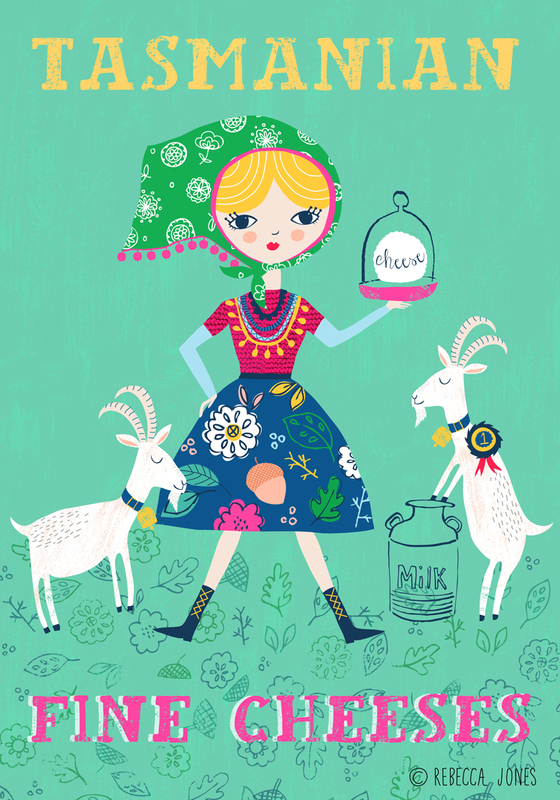 I did a couple of pages of rough sketches and ideas, but couldn’t seem to stick to the theme of clocks – I found myself drawing animals and Swiss milk maids. 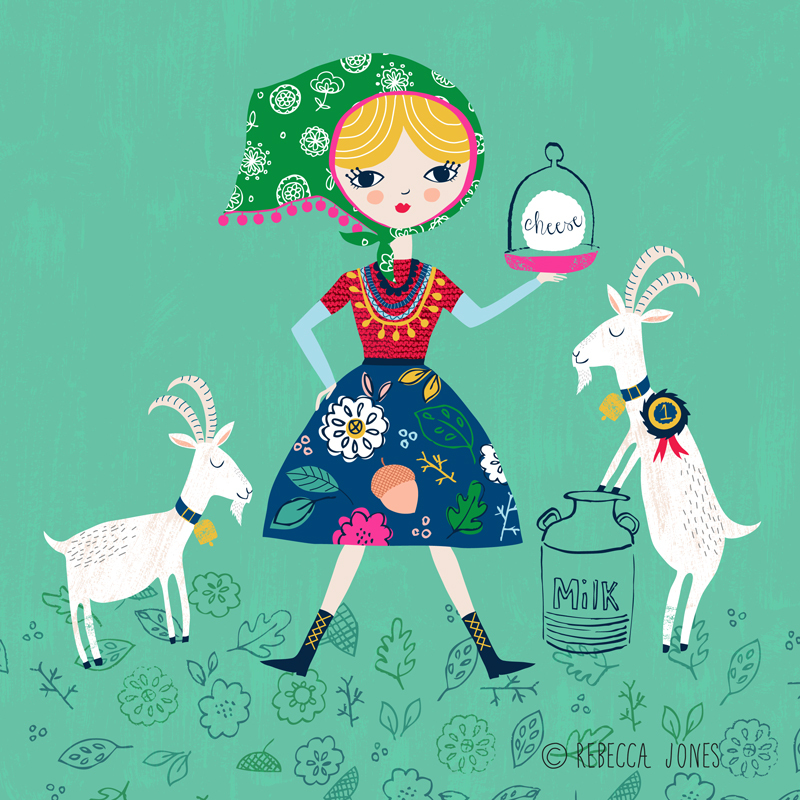 And before I knew what was happening, my milk maid had turned into a goat farmer. I think it must be all the goats cheese I was obsessed with eating whilst in Tasmania…. 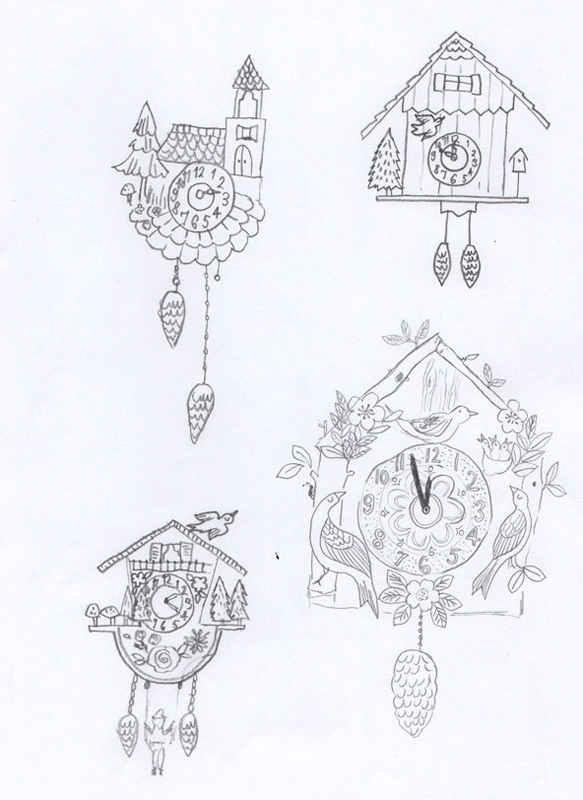 And now I really should get back to drawing cuckoo clocks, I haven’t got a whole lot of time left to complete my assignment on time! 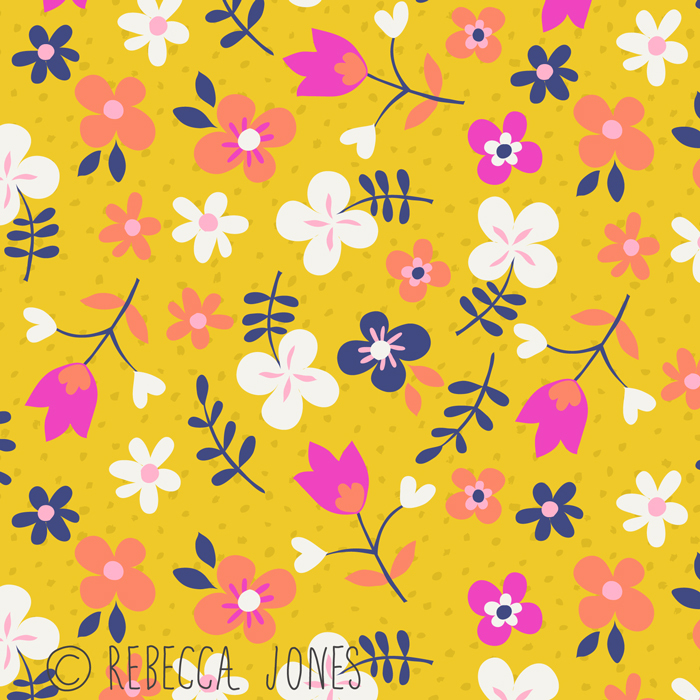 Two summery colourways, not sure which is my favourite? 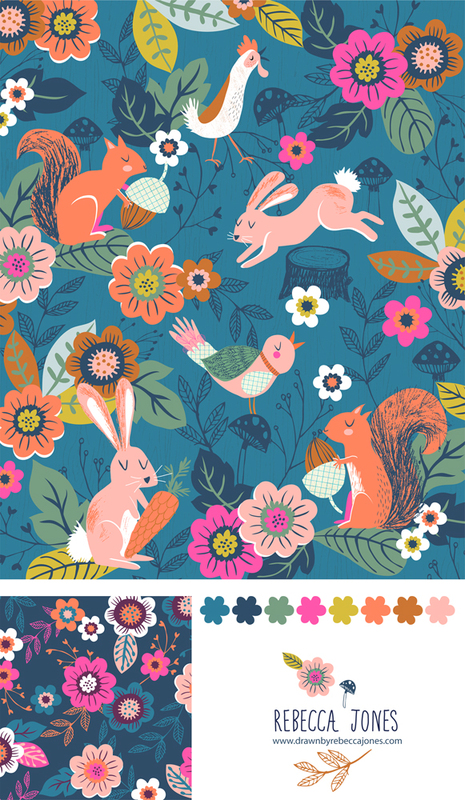 I'm an English textile designer and illustrator now living in Melbourne, Australia. Please answer this question to prove you're human and not some kind of nasty spam robot, thank you. 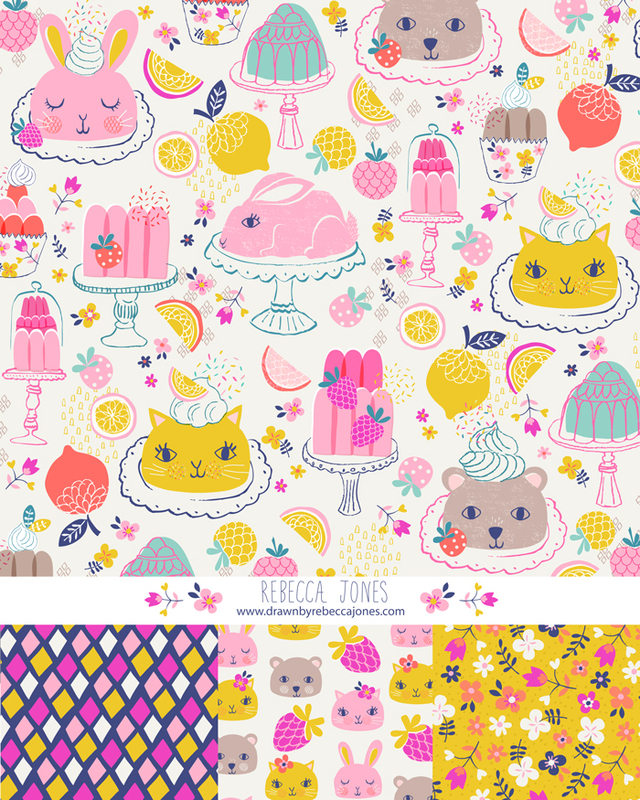 Please note that the copyright of all designs featured on this website is owned by me. Please do not copy them or use them without prior permission. Thank you, Rebecca.